As the 2018 Vickie Burke Intern for Women’s History, I have spent the summer thinking about Evanston women and the fight for suffrage. Evanston is an ideal place to study women’s suffrage, because the town can be seen as a microcosm of the national suffrage battle. There is a rich local heritage of activism, and there were many local women who became players on the national stage. I have been building upon the work of others, including past Vickie Burke Interns, to add to the website, Evanston and the 19th (now renamed Evanston Women and the Fight for Suffrage). The fight for women’s suffrage had many milestones besides the eventual passage of the 19th Amendment to the Constitution. I have been researching earlier milestones, especially victories in Illinois like 1891 school board suffrage and Illinois state suffrage in 1913. 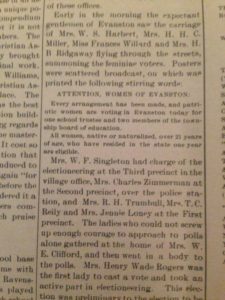 An 1892 notice of voting procedures for Evanston women. I’ve also been working on research and planning for the upcoming suffrage centennial exhibit in 2020. My work in this area has involved finding out what themes emerge in the story of Evanston and women’s suffrage. I have done research on aspects of this special history that are specific to Evanston but also connect to national narratives. There is a lot of decision-making in exhibit planning, and I have been learning how to craft a cohesive story out of piles of information. One of the themes that has become clear to me throughout the course of this project is that of suffragists as strategists. There were many avenues that these women pursued in order to get their message across and to persuade others to join their cause. The mental image most people have of suffragists is one of women with big hats and protest signs. I have found it compelling to think about the many different ways that suffragists worked. Suffragists were political thinkers, strategists, and legal minds. They used many different tactics in their struggle, including letter-writing campaigns, taking legal action, automobile tours throughout the state, public speaking, and public demonstrations. Suffrage is an evolving issue–who gets to vote is a central question of democratic societies. This summer, working with the Evanston Women’s History Project, I’ve fortunate to work with others to find out more about the women’s suffrage story and its local connections.